Carbon monoxide poisoning results in approximately 400 deaths in the United States each year. In addition, 20,000 people visit an emergency room and 4,000 of them are admitted to the hospital. Unfortunately, carbon monoxide poisoning can happen because of everyday items in the home being used improperly or not being maintained. Understanding carbon monoxide poisoning and its causes can help you to keep your aging relative safer at home. Furnaces or Boilers that burn oil. Appliances that use gas, like water heaters. Carbon monoxide poisoning happens when a person breathes in the gas and it builds up in the blood. The carbon monoxide attaches itself to the hemoglobin in the red blood cells. That means that there’s no space for oxygen to attach to. Because the hemoglobin cannot carry oxygen throughout the body, tissues become oxygen deprived and die. -The best way to prevent carbon monoxide poisoning is to make sure your family member has a working carbon monoxide detector in their home. Detectors should be in parts of the house where they will wake up the older adult if they go off, such as outside the bedroom. -The detector should be either battery operated or be backed up by a battery. Change the battery twice yearly, such as when you change the time on the clock in the spring and fall. Carbon monoxide detectors should be replaced every 5 years. -In addition to having carbon monoxide detectors, be sure to have appliances that produce carbon monoxide serviced regularly. Also, chemical heaters shouldn’t be used inside and gas ranges or ovens should not be used for heating. In addition, never use portable generators, charcoal grills, or camp stoves inside a house or camper. 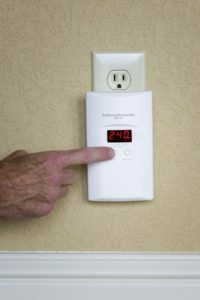 Elder care providers can help keep older adults safe from carbon monoxide poisoning as well. An elder care provider can change the batteries in the detectors. When it’s time to purchase a new detector, elder care can offer the senior a ride to the hardware store to get one. 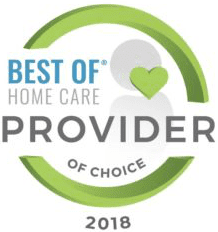 Elder care providers can also be present when technicians come to service an appliance, making them feel safer and assisting them with paying the bill.